Forest Court: A medieval court established for the administration of forest law. In medieval times, Calverton appears to have been a relatively important centre. 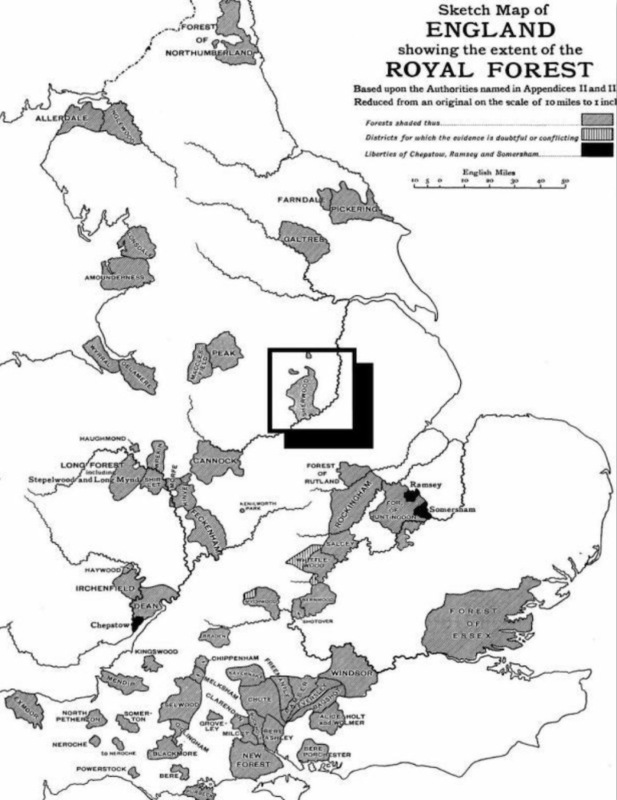 It was within the area of the Royal Forest of Sherwood and was one of four places (the others were Edwinstowe, Linby and Mansfield) where Forest Courts were held every six weeks. These courts operated from 1287 onwards and were concerned with the management of the Forest and cases of trespass by people and animals. Records for 1330 show that each of the courts met eight times during the year. The courts were administered in accordance with the Forest charters. For convenience, the Forest was divided into three wards or keepings. A Forest Book recording all the governing laws and ordnances by which it was governed was used by the officers of Sherwood Forest. Game in the Forest was protected by law but deer-stealing was common. In fact the Forest was an unruly area. Disputes over the land ownership was a frequent source of quarrels between neighbours, poaching was endemic, and thieves preyed upon unprotected travellers. The courts sought to control the straying of beasts within the Forest by imposing fines upon their owners. In 1330, fines of 1d were recorded for the straying of a cow, yearling, bull or heifer, 3d for five sheep and 8d for twenty-six sheep. A ruling made in 1281 gives an insight into the arrangements that were set up for the management of land between the courts and landowners. The Abbot of Rufford was allowed to make a 40ft wide trench in his own woods and given general freedom to develop the Abbey's land as he saw fit but he was also summoned to liaise with the Forest keepers about how to dig the trench and manage the land. Why he wanted the trench in the first place is not recorded. The last Forest Court was held at Mansfield in 1662. The Assize of the Forest (also known as the Assize of Woodstock) in 1184 laid down in detail the organisation and administration of forest Law. Offences against forest law were outside the area of common law and were divided into two categories. The first was trespass against the venison, which is the game and is the one offence everyone immediately thinks of thanks to all those films and TV shows showing Robin Hood shooting deer and being chased by the sheriff’s men. The second less well-known one was trespass against the vert, which is the environment that supports the game. Although forest law was originally concerned with protecting the deer, the boar and the wolf (which didn’t seem to have worked since the boar and the wolf eventually became extinct in England) the categories of animals have historically been listed under “beasts of the chase” and “beasts and fowls of warren”. The beasts of the chase were the likes of the doe (female deer) and buck (male deer), the roe deer and the fox. The beasts and fowls of warren were the likes of the rabbit, hare, pheasant and partridge. As has been mentioned before, for a fee, the rights of chase and of warren could be granted to the local nobility. If you weren’t a noble the only way you could hunt the likes of a deer were if you were a legitimate forester or you fancied running the gauntlet and trying your hand at a bit of poaching. The historical record seems to indicate that it wasn’t just your down and out peasant who liked a bit of poaching though. Minor nobility might hunt without license as well as the occasional clergyman and even the odd wayward forester who was paid to know better. As simple as the trespass against the venison was i.e. don’t shoot the animals, the trespass against the vert was a bit more complicated. Clearing land for agriculture by felling trees and clearing shrubs was called “assarting”. Enclosing land for buildings or for pasture was called “purpresture”. The right of taking firewood was called “estover”. The right to pasture swine in the forest was called “pannage”. The right to cut turf for fuel was called “turbary”. Rights of pasturage was called “agistment”. Disafforested lands on the edge of a forest were known as “purlieu” which meant that the land after having been included in a royal forest, was restored to private ownership and therefore could be used for agriculture. Although these purlieu were still subject to the operation of the forest laws! It wasn’t until the Charter of the Forest in 1217 that all freemen owning land within a forest enjoyed the universal right such as agistment (rights of pasturage) & pannage (pasturing swine). Amazingly this charter was still in force right up until 1971. You’ve got the laws, so who’s going to enforce them? Well, Hollywood might have us believe that in the forest that’d be exclusively the remit of the sheriff and his chain mail clad solders, but that was not the case. At the top of the forest law official tree (if you pardon the pun) was the Warden of the Forest. At least that was the title used between 1311 and 1397 as before and after these dates the title was Justices in Eyre (Eyre meaning “circuit”, referring to the movement of the court between the royal forests). 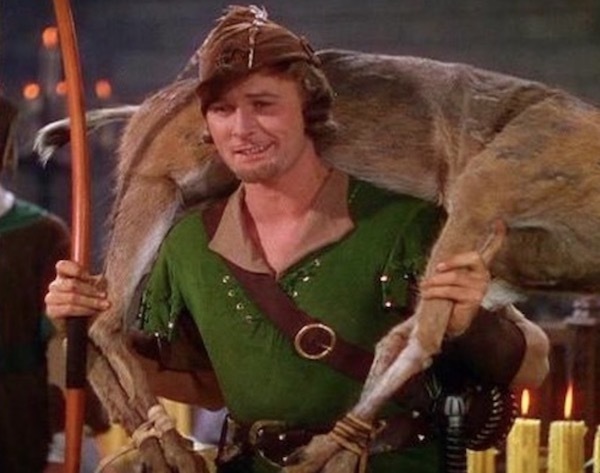 Remember how Robin Hood was always breaking the law by shooting “the king’s deer?” The deer was a royal animal, which meant you couldn’t kill one without express permission from the crown. Same thing for whales after a statute enacted during the reign of Edward II. In addition to whales, sturgeon and porpoises were also deemed Royal Fish. Next were the main foot solders, the foresters. Foresters were charged with preserving the vert, venison and apprehending offenders against the forest law. Each forester was assigned a patch of forest to look after called a ward, a walk or a bailiwick. The forester would also enforce chiminage (a toll for passage through the forest a.k.a. road tax) for chiminagium (right of way) and also levy the exaction of ale, or the equivalent in money, in the event of a festivity. The later Charter of the Forest (1217) defined & restricted chiminage and scotage (the keeping of an ale house by an officer of the forest) which seems to indicate that these duties were routinely abused by unscrupulous foresters. We’ll be looking at the foresters in greater depth later in this article. The agisters were charged with supervising the pannage (the pasturing of swine) and the agistment (all other rights of pasturing) which generally meant the collection of fees for the privilege. The literal and ears were the surveyors who determined the boundaries of the forest and the regarders or regardors (from the French, regarde, to see). These officers reported up to the Warden when there were infringements on the forest and incursion on the royal rights as stipulated under asserting (clearing of forest) and purpresture (enclosing of land for pasture or building). Regarder and surveyor visits provided a check against collusion between the foresters and local offenders which, as the historical record shows, did happen occasionally. The hierarchy for foresters was on the face of it fairly simple. There were foresters-in-fee who could be classified (from lowest to highest) as under-foresters, foot or walking foresters & riding foresters. The Crooked Stick by Hugh D. H. Soar says that “in addition to regular foresters there were in the Royal Forest of Kingswood near Bristol arrow men who’s day-to-day task, it would seem, was to keep order within the forest boundaries. Housed within a tower of Bristol’s castle, contemporary documents suggest that they had a less-than-savoury local reputation.”. Woodcut of Robin Hood from 1508 that has been used to represent Geoffrey Chaucer’s yeoman archer & now he’s my riding forester. There is also evidence that the foresters-in-fee were colloquially called woodwards and that the under-foresters were called rangers, however the term ranger (coming from the fact that the forester ranged across the land) does not appear until after 1350. The riding foresters were also called bow-bearers because they had the right to carry a strung bow in the forest, where as their sub-ordinates needed a warrant from the Warden to do so. To confuse things further the term serjeants-in-fee can also come up as a term for a form of forester that held land in return for service. This was because the term serjeant was the holder of a serjeanty, a type of feudal land-holding in England and should not be confused with the later army rank of sergeant! The foresters would be paid around 2d per day and in addition receive a certain amount of wood and venison.